NEW YORK (WABC) -- A former notorious pharmaceutical executive may have more legal trouble. Martin Shkreli appeared Tuesday in Brooklyn federal court. Prosecutors say that he and a co-defendant could face additional fraud charges. Shkreli is already accused of illegally taking money from one of his companies to pay off market losses at another. While Shkreli drew headlines when he boosted the price of an HIV drug by 5,000 percent, his charges are unrelated to that. Shkreli was arrested last December on securities fraud charges. Shkreli, the former CEO of Turing Pharmaceuticals, is charged with losing investors' money through bad trades -- then taking $11 million from his former company to pay disgruntled clients. Turing sparked an angry backlash last year after raising the price of Daraprim, the only approved treatment for a rare parasitic infection called toxoplasmosis that mainly strikes pregnant women, cancer patients and AIDS patients, by 5,000 percent. 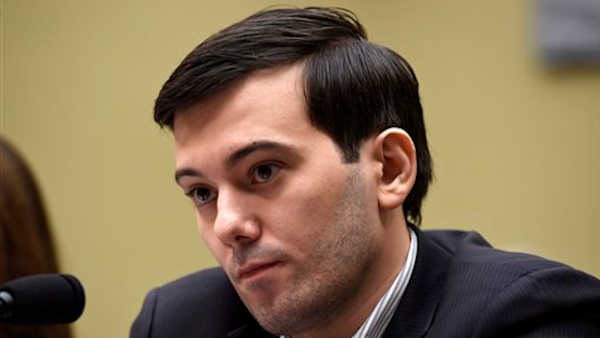 Turing ended up reducing what it charges hospitals for Daraprim by as much as 50 percent. Most patients' copayments will be capped at $10 or less a month. But insurance companies will be stuck with the bulk of the tab, potentially driving up future treatment and insurance costs.